Walking your dog or sitting your cat will be the highlight of our employees’ day. 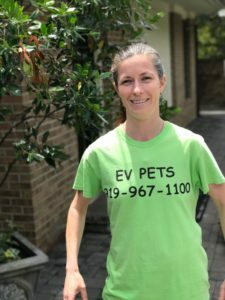 Our team members have had years of experience with animals and when they aren’t working for EV Pets they frequently volunteer at the local animal shelter. All of our services are one furry friend to two of our team members to ensure your pet is given extra care. Our organization is insured and we check all of our employees’ backgrounds so you can feel confident about trusting your beloved pet with us. EV Pets is a division of Extraordinary Ventures, Inc. a nonprofit that runs small businesses to employ adults with developmental disabilities like autism. Ewan loves saying good morning to dogs and cats. After his visit with your pet, he will talk about them the rest of the day to everyone he meets. Michael is an amazing storyteller who after getting to know your pet will actually write them into his stories. His energetic pace and attention to detail and order will keep your pet on a routine that they will look forward to everyday. Adam is an avid lover of history, movies, soft rock and pets. Adam gives your furry friend a history lesson and lots love during every walk. 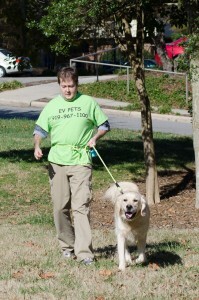 Michael J. has been with EV Pets as a dog walker for over a year. He loves taking care of animals, including his own animals that he has at home. Michael loves to tell jokes and make people laugh. He brings joy with him everyday and to everyone that he meets. 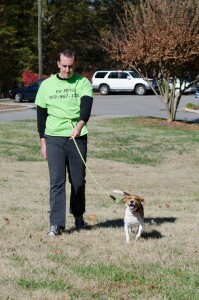 Alex B. has been a dog walker for EV Pets for about a year. 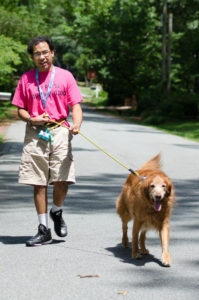 He has lots of experience walking dogs for his family and friends. Alex is a hard worker who will always be on time and ready to walk! In his free time, Alex enjoys listening to music on his iPod and meeting new friends. Susan is a very active and energetic dog walker and cat care professional at EV Pets. She has experience working in a vet office, and loves meeting as many “furry friends” as possible. In Susan’s spare time, she loves taking care of her animals at home and working out at the gym. Susan is our EV Pets dog walking substitute for all of our clients.